This post is the first in a series of posts that focus on the global proliferation and use of Hacking Team’s RCS spyware, which is sold exclusively to governments. 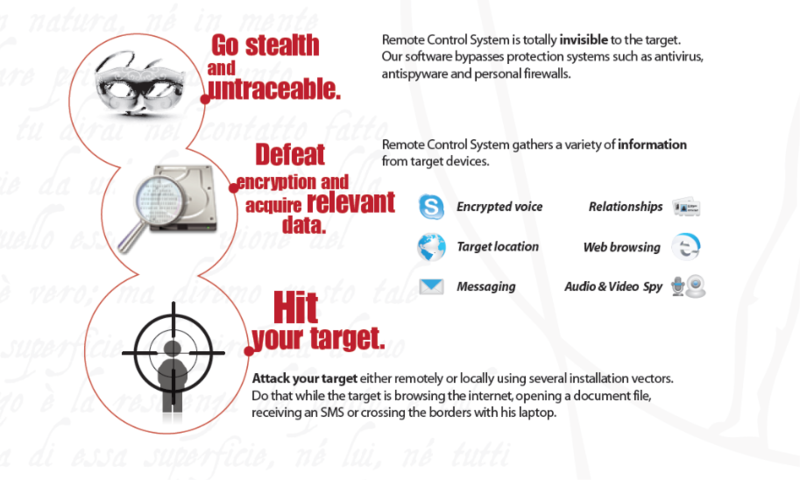 Read the second report in the series, “Mapping Hacking Team’s “Untraceable” Spyware“. On the issue of repressive regimes, Hacking Team goes to great lengths to assure that their software is not sold to governments that are blacklisted by the EU, US, NATO, and similar international organizations, or to any “repressive” regime. First, the ESATSTUDIO Skype account was targeted with spyware. This account is used by ESAT for on-air interviews. The individual operating the ESATSTUDIO account at the time was an ESAT employee in Belgium, responsible for managing ESAT’s satellite broadcasts. An individual identified as “Yalfalkenu Meches” (Skype: yalfalkenu1) sent a file to ESATSTUDIO entitled “An Article for ESAT.rar.” We use Skype logs provided by the targets to illustrate the attacks. 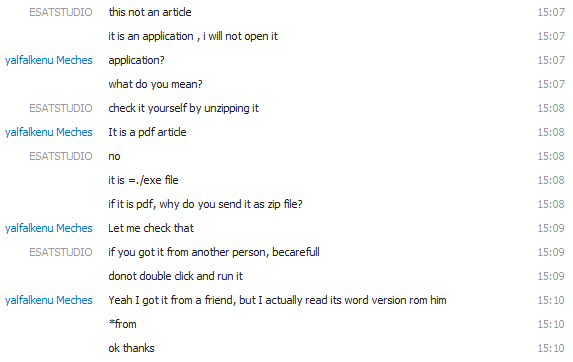 This .rar file contained an .exe file disguised as a .pdf. The file used the Adobe PDF icon, and contained a large number of spaces between the name and extension, to prevent Windows from displaying the extension. Despite the file’s name, “An Article for ESAT,” the file did not display any such article, or any other content, when opened. The file communicated with a server that returned two SSL certificates. 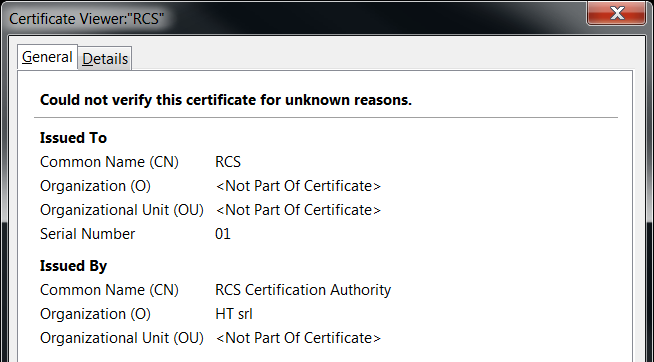 The second certificate was issued by “RCS Certification Authority” / “HT srl”, and was similar to SSL certificates returned by two other servers apparently owned by Hacking Team. The first certificate was similar to certificates returned by two other servers that appeared to be demonstration servers for Hacking Team’s RCS spyware. The file matched a signature that we had previously developed for RCS spyware. Shortly after opening the .exe file, it attempted to communicate with the server 46.4.69.25 on port 80. The address and phone number on the range matches those on Hacking Team’s website. A Giancarlo Russo is listed as the Chief Operating Officer of Hacking Team on LinkedIn.42 Thus, we believe that Hacking Team controls this range of IP addresses. Because these IP addresses were registered to Hacking Team, we believe that the presence of a certificate apparently issued by “RCS Certification Authority” / “HT srl” is indicative of a server for Hacking Team’s RCS spyware. The Internet Census (443-TCP_SSLSessionReq) also recorded two instances of a server returning a certificate that matched the “default” / “server” certificate returned by the server in the ESAT spyware, along with an incomplete certificate for “rcs-demo.hackingteam.it.” This server was used by an RCS spyware sample found in VirusTotal.43 This certificate was returned by 168.144.159.167 on 12/14/2012, and by 94.199.243.39 on 12/14/2012. This is a further indication that the server in the spyware targeting ESAT is a Hacking Team RCS server. The file itself also matched a signature we had previously developed for RCS spyware. The target did not open the first file (“An Article for ESAT.exe”), and complained to Yalfalkenu that the file was an .exe application. Yalfalkenu responded that he had received the file from a friend. Yalfalkenu also said that he opened the .exe file and it “worked fine.” However, despite the file’s name, “An Article for ESAT,” the file did not display any such article, or any other content, when opened. Yalfalkenu followed up by sending ESATSTUDIO a Word document. As with the previous file, opening this file did not result in any bait content being displayed. A user who opened the file saw a blank Word document, which quickly closed itself. Like the first file, the file communicated with 46.4.69.25. This file also matched our signature for RCS spyware. For the same reasons as the first file, this file appears to be Hacking Team RCS spyware. An hour and a half later on the same day,47 Yalfalkenu targeted another ESAT employee, this time based in their Northern Virginia offices. As in the previous two files, the file communicated with 46.4.69.25. This file also matched our signature for RCS spyware. For the same reasons as the first two files, this file appears to be Hacking Team RCS spyware. After the first two targeting attempts, we alerted ESAT that Yalfalkenu Meches was trying to target them with spyware. On the third attempt,the targeted user confronted Yalfalkenu, who again professed that he had received the file from a friend. Yalfalkenu also expressed puzzlement about how opening a Word document could infect a computer, and said that he was a victim. We talked to employees of ESAT, who said that Yalfalkenu used to collaborate with them, but then he “disappeared for a while.” It is possible that someone else is now using Yalfalkenu’s account. 216.118.232.245 11/18/2013 Active Ariave Satcom ?? We note that the “RCS Certification Authority” / “HT srl” SSL certificates returned by these servers were issued on 5/8/2012. Based on this date, we estimate that the attacker who targeted ESAT has been using Hacking Team’s RCS spyware since May 2012, or earlier. In this report, we identified three instances where Ethiopian journalist group ESAT was targeted with spyware in the space of two hours by a single attacker. In each case the spyware appeared to be RCS (Remote Control System), programmed and sold exclusively to governments by Milan-based Hacking Team. While Hacking Team and other “lawful intercept” spyware vendors purport to practice effective self-regulation, this case seems to be part of a broader pattern of government abuse of such spyware. “Lawful intercept” spyware has also apparently been abused to target Bahraini activists, Moroccan journalists, critics of the Turkish Government, and Emirati human rights activists. Thanks to Eva Galperin, the Electronic Frontier Foundation, and ESAT. 1“About ESAT,” Ethiopian Satellite Television, accessed February 13, 2014, http://ethsat.com. 2 “About ESAT,” Ethiopian Satellite Television, accessed February 13, 2014, http://ethsat.com. 3 “ESAT Accuses China of Complicity in Jamming Signals,” Ethiopian Satellite Television, June 15, 2011, accessed February 13, 2014, http://ethsat.com/2011/10/08/esat-accuses-china-of-complicity-in-jamming-signals. 4 “UDJ Says Expressing Opinion to Media is Not ‘Terror’,” Ethiopian Satellite Television, January 9, 2013, accessed February 13, 2014, http://ethsat.com/2014/01/09/udj-says-expressing-opinion-to-media-is-not-terror. 5 “Technology,” Ariave Satcom, accessed February 13, 2014, https://web.archive.org/web/20130723051052/http://ariave.com/tech.htm. 6 “Customer Policy,” Hacking Team, accessed February 13, 2014, http://hackingteam.it/index.php/customer-policy. 7 Declan McCullagh, “Meet the ‘Corporate Enemies of the Internet’ for 2013,” CNET, March 11, 2013, accessed February 13, 2014, http://news.cnet.com/8301-13578_3-57573707-38/meet-the-corporate-enemies-of-the-internet-for-2013/. 8 Mónica Almeida, “Firma Hacking Team Fue Contactada Por Estado Ecuatoriano,” El Universo, December 11, 2013, accessed February 13, 2014, http://www.eluniverso.com/noticias/2013/12/11/nota/1901271/firma-hacking-team-fue-contactada-estado-ecuatoriano. 9 David Gilbert, “Hacking Team and the Murky World of State-Sponsored Spying,” Interntional Business Times, March 13, 2013, accessed February 13, 2014, http://www.ibtimes.co.uk/hacking-team-murky-world-state-sponsored-spying-445507. 10 “Customer Policy,” Hacking Team. 11 “Ethiopia Arrests 2 Journalists From Independent Paper,” Committee to Protect Journalists, November 5, 2013, accessed February 13, 2014, http://www.cpj.org/2013/11/ethiopia-arrests-2-journalists-from-independent-pa.php. 12 “Ethiopia,” Human Rights Watch, accessed February 13, 2014, http://www.hrw.org/world-report/2013/country-chapters/ethiopia. 13 “They Want a Confession,” Human Rights Watch, October 17, 2013, accessed February 13, 2014, http://www.hrw.org/node/119814/section/2. 14 “Ethiopia,” Human Rights Watch. http://www.hrw.org/world-report/2013/country-chapters/ethiopia?page=3. 16 “The Solution,” Hacking Team, accessed February 13, 2014, http://hackingteam.it/index.php/remote-control-system. 17 Hacking Team, Remote Control System: Cyber Intelligence Made Easy, accessed February 13, 2014, http://wikileaks.org/spyfiles/docs/hackingteam/147_remote-control-system.html. 18 “Spyware. HackingTeam,” Secure List, April 23, 2013, accessed February 13, 2014, https://www.securelist.com/en/analysis/204792290/Spyware_HackingTeam. 19 Adrianne Jeffries, “Meet Hacking Team, the Company That Helps the Police Hack You,” The Verge, September 13, 2013, accessed February 13, 2014, http://www.theverge.com/2013/9/13/4723610/meet-hacking-team-the-company-that-helps-police-hack-into-computers. 21 Pratap Chatterjee, “Turning the Table on the Trackers: Wikileaks Sniffs out Spy Salesmen,” CorpWatch, September 6, 2013, accessed February 12, 2014, http://www.corpwatch.org/article.php?id=15868. 22 Ryan Gallagher, “How Government-Grade Spy Tech Used A Fake Scandal To Dupe Journalists,” Slate, August 20, 2012, accessed February 14, 2014, http://slate.me/1eSTeUF. 23 “Ahmed Mansoor and Four Other Pro-Democracy Activists Pardoned and Freed,” Reporters Without Borders, November 28, 2011, accessed February 13, 2014, http://en.rsf.org/united-arab-emirates-ahmed-mansoor-and-four-other-pro-28-11-2011,41477.html. 24 “UAE Arrests Democracy Activists,” BBC, April 11, 2011, accessed February 13, 2014, http://www.bbc.co.uk/news/world-middle-east-13043270http://www.bbc.co.uk/news/world-middle-east-13043270. 25 Morgan Marquis-Boire, “Backdoors are Forever: Hacking Team and the Targeting of Dissent?,” Citizen Lab (2013), October 2012, accessed February 13, 2014, https://citizenlab.ca/2012/10/backdoors-are-forever-hacking-team-and-the-targeting-of-dissent. 26 Kim Zetter, “American Gets Targeted by Digital Spy Tool Sold to Foreign Governments,” Wired, June 4, 2013, accessed February 13, 2014, http://www.wired.com/threatlevel/2013/06/spy-tool-sold-to-governments/. 27 Christopher Soghoian, Twitter Post, February 5, 2013, 1:03 p.m., accessed February 13, 2014https://twitter.com/csoghoian/status/298899565388644352. 28 “Corporate Enemies,” Reporters Without Borders, accessed February 13, 2014, http://surveillance.rsf.org/en/category/corporate-enemies. 30 The Economist Intelligence Unit, Democracy Index 2012 (2012), accessed February 13, 2014, https://www.eiu.com/public/topical_report.aspx?campaignid=DemocracyIndex12. 31 “Freedom of the Press Worldwide in 2013,” Reporters Without Borders, 2013, accessed February 13, 2014, https://en.rsf.org/IMG/jpg/2013_wpfi_world_press_freedom_map.jpg. 32 “Ethiopia: Terrorism Law Decimates Media,” Human Rights Watch, May 3, 2013, accessed February 13, 2014http://www.hrw.org/news/2013/05/03/ethiopia-terrorism-law-decimates-media. 33 “Jailed Ethiopian Journalist Eskinder Nega Honoured,” BBC, May 2, 2012, accessed February 13, 2014, http://www.bbc.co.uk/news/world-africa-17921950. 34 “Top PEN Prize to Honor Eskinder Nega, Jailed Ethiopian Journalist and Blogger,” PEN America, April 12, 2012, accessed February 13, 2014, http://www.pen.org/press-release/2012/04/12/top-pen-prize-honor-eskinder-nega-jailed-ethiopian-journalist-and-blogger. 36 “Eskinder Nega; A Journalist Behind Bars,” Amnesty International, November 6, 2013, accessed February 13, 2014, https://www.amnesty.org/en/appeals-for-action/LWM2013-Ethiopia. 37 “ESAT Accuses China of Complicity in Jamming Signals,” Ethiopian Satellite Television. 38 Morgan Marquis-Boire, Bill Marczak, Claudio Guarnieri, and John Scott-Railton, “You Only Click Twice: FinFisher’s Global Proliferation,” Citizen Lab (2013), accessed February 13, 2014, https://citizenlab.ca/2013/03/you-only-click-twice-finfishers-global-proliferation-2/. 39 This can be verified by consulting the Sonar SSL scans (https://scans.io/study/sonar.ssl) between 10/30/2013 and 1/13/2014. 40 Carna Botnet, “Internet Census 2012 Port scanning /0 using insecure embedded devices,” accessed February 13, 2014, http://internetcensus2012.bitbucket.org/paper.html. 44 “CVE-2012-0158,” Mitre, accessed February 13, 2014, http://www.cve.mitre.org/cgi-bin/cvename.cgi?name=CVE-2012-0158. 45 Security TechCenter, “Microsoft Security Bulletin MS12-027 – Critical,” Microsoft, April 10, 2012, accessed February 13, 2014, http://technet.microsoft.com/en-us/security/bulletin/ms12-027. 47 Belgium’s time zone is six hours ahead of Virginia’s.